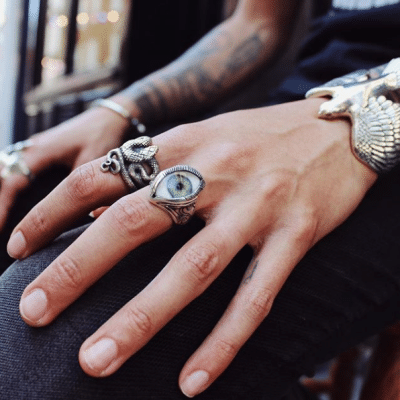 Our eye rings are one of our oldest and most popular designs and come in three different ring settings: Beaded, Horizontal and Engraved, as well as a Pendant and a Bolo Tie. Originally we used glass eyes for our rings, but have in more recent years changed to resin, as this is softer and less prone to breaking. Our optic eyes are the same ones that can be found in the London Eye Hospital, and just as our gem stones, no eyes will never be the same. The symbolism behind our Eyes is up to interpretation as eyes have different meanings in different cultures, however, something that’s common to most of them is that the eyes are known to be the windows to the soul, which might be the reason why their symbolic meaning tends to be one of spiritual nature. In Christianity the eye is depicted as the Eye of God, representing his presence, where in Egypt we have The Eye of Horus or The Eye of Ra, where the eye is a symbol of protection and life. People also talk about “The third Eye”, which refers to the spiritual eye, eye of the soul of the intuitive eye. The third eye is depicted on Shiva’s forehead and is symbolic of the inner eye that sees all things with a cosmic perspective. 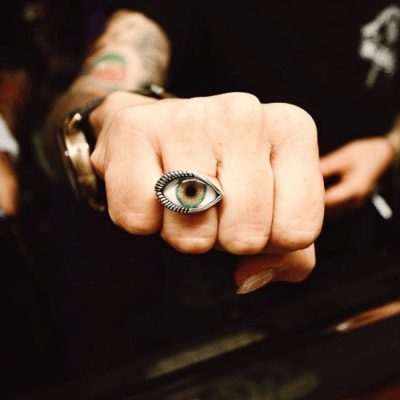 As far as eye symbolism goes in our rings, that is up to our customers to decide. Some might wear one as an amulet protecting them from evil eye, some as a reminder of a loved one, while others for no reason at all, despite the fact that they love the design. 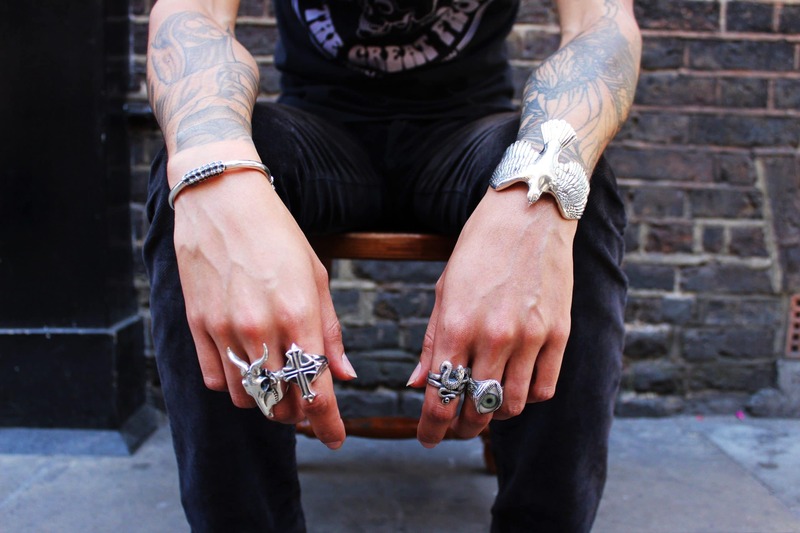 Our eye rings comes in a variety of settings and colours, and you can view them all here.